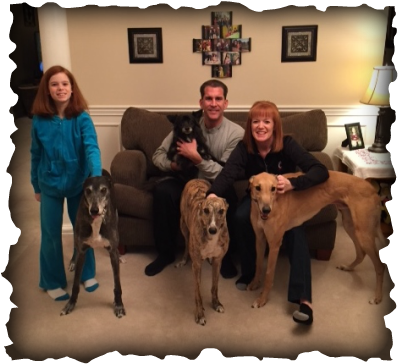 Wiki Magic Mike was adopted in West Chester by GAGC members Sara, Doug, Emily and their two greyhounds, Wally and Rumy. Little Bit in Doug's arms is the leader of the pack :) They have fostered for us and when they came to pick up Mikey as a foster, he connected with Sara immediately, when he got to their house he made himself at HOME! Just a couple days later, he was adopted! Doug's mother's birthday was today and he felt it would be a nice celebration in her memory to adopt Mikey!